Pay Your Bill, Manage Your Service, Report a Trouble, and much more! *View your bill online: See charges for services, telephone calls, and more! *Pay Your Bill: E-Care is a secure way to pay your Citizens invoice. E-Care allows you to pay monthly or set up recurring Autopayments from the convenience of your computer. *Upgrade Your Citizens Services: E-Care is a convenient way to upgrade your services. From the Quick Links Menu, you can increase your internet speed, TV package, add Calling Features to your phone, and much more! *Report a Service Trouble: Through Citizens' E-Care, you can report any issue that you may have with your service 24/7. You can also check the status and receive updates all within your E-Care account. We care about our customers and our environment. E-Care saves paper and the cost of stamps. It also saves time by allowing you to pay your bill and other transaction when it’s convenient for you! Grab your invoice and click here to get started! Please have your checking account or credit card information ready. Click here to check your voicemail online. We honor the privacy of our customer’s account information. In fact, you have a right and we have a duty, under federal law, to protect your account information known as CPNI — Customer Proprietary Network Informaton. Please click here, complete the form and return to the nearest Citizens office or mail with your bill. Cusomer Name, Account Number, Bill Date, Telephone, and Page Sequence. Avoid the hustle and hassle of paying your Citizens bill. 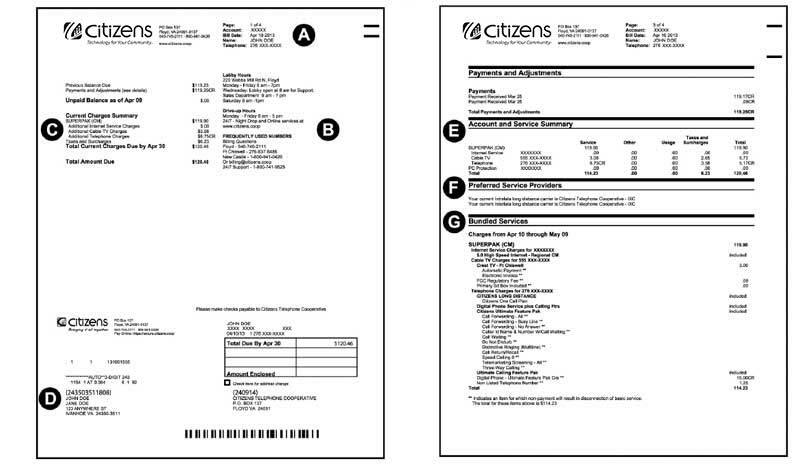 Citizens has five easy ways to make paying your bill convenient. Please try one of our easy payment options. Auto-Pay Online - Have your current Citizens bill and credit card on hand, select "Click here to pay your bill" button above and follow the set up instructions. In-Person - We invite you to come in to make your payments or drop your payment into our night-drop box. We are sure you will find one of our five easy payment options convenient for you. If we can be of further assistance with your communication and entertainment needs, we welcome your call or visit.